Its ultrasonic spray emits a light mist of water that diffuses the essential oils and pleasantly humidifies dry air. Equipped with a timer, it stops automatically after 30 minutes or when there is no more water. The misting is caused by the vibration of a very high-frequency ceramic chip which causes ultrasounds by its movement. That’s why the Ocelia diffuser uses ultrasonic misting. The diffusion of essential oils is achieved using this ultrasonic misting technique. Fill the water reservoir, taking care not to exceed the maximum level, and then add 5 or 6 drops of essential oils. By pressing ""MIST"", the diffuser operates at set intervals (30 seconds of diffusion then 30 seconds off). 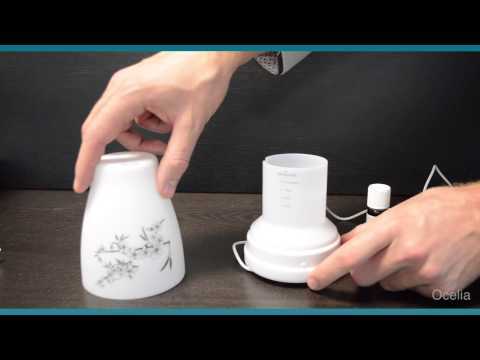 To look after your diffuser, monthly cleaning is ideal. Unplug the device. Use pharmaceutical alcohol, heat it to between 40 and 50°C and place it in the water tank. Let the alcohol steep for 10 minutes. Remove the alcohol and clean with a cotton swab moistened with this alcohol. Do not bother too much with cleaning the membrane, which cleans itself as it vibrates. Rinse with lukewarm water, and wipe a little, without going to the bottom of the tank. If your diffuser is covered in scale, use vinegar. Heat the vinegar to 40-50°C and place in the reservoir. Do not switch on the appliance, but leave it to steep for 10 to 15 minutes; remove the liquid and perform a conventional cleaning operation.